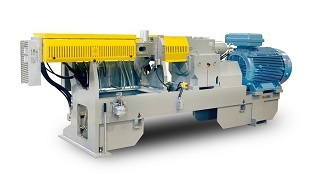 Significant operational and cost benefits follow Baker Perkins’ decision to apply PLC control and AC drive technology to its complete range of twin-screw extruders for powder coating. PLC control with a touch-screen HMI is inherently more reliable than the push-button and relay logic equipment it replaces. Benefits for management and operators include full process visualisation, and the availability of data logging, historical trending, alarm handling and history, a controlled start and stop sequence minimising waste, and the option to connect to a control system for the complete plant. A lower maintenance requirement which reduces costs is a major advantage of AC drive compared with the DC alternative. There are no bushes to check and replace, and if a problem occurs this can be relayed as an error message to the HMI to be dealt with immediately. With no fan for cooling, operation is quieter. Advances in AC inverter technology mean that the drive is used to maximum effect: torque characteristics are set to match the need of each individual extruder, eliminating the overpowering common on competitive machines. Output is maximized without wasting energy, and ongoing production cost per kilogram reduced. Initial installation cost is also lowered. Design for purpose is an attribute of every Baker Perkins powder coating extruder - these machines are specifically engineered for the requirements of the industry. Competitive production costs are accompanied by consistent, high quality. A key feature is through-shaft cooling which increases heat removal from the shafts and screw elements, removing hot spots from the mixing edges. This reduces pre-melt on the feed screws and eliminates re-curing of product in the extruder barrel, giving an overall better quality. Baker Perkins' extruders are suitable for all types of powder coating formulation, in outputs ranging from small batches to 2,900 kg per hour.